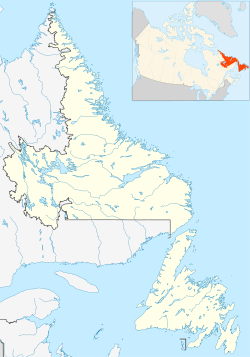 Canadian Forces Base Goose Bay (IATA: YYR, ICAO: CYYR), commonly referred to as CFB Goose Bay, is a Canadian Forces Base located in the municipality of Happy Valley-Goose Bay in the province of Newfoundland and Labrador. It is operated as an air force base by the Royal Canadian Air Force (RCAF). Its primary RCAF lodger unit is 5 Wing, commonly referred to as 5 Wing Goose Bay. The airfield at CFB Goose Bay is also used by civilian aircraft, with civilian operations at the base referring to the facility as Goose Bay Airport. The airport is classified as an airport of entry by Nav Canada and is staffed by the Canada Border Services Agency (CBSA). CBSA officers at this airport can handle general aviation aircraft only, with no more than 15 passengers. The mission of 5 Wing is to support the defence of North American airspace, as well as to support the RCAF and allied air forces in training. Two units comprise 5 Wing: 444 Combat Support Squadron (flying the CH-146 Griffon) and 5 Wing Air Reserve Flight. CFB Goose Bay also serves as a forward operating location for RCAF CF-18 Hornet aircraft and the base and surrounding area is occasionally used to support units of the Canadian Army during training exercises. While the flat and relatively weather-favoured area around North West River had for years been under consideration for an airport for the anticipated North Atlantic air routes, it was not until Eric Fry of the Dominion Geodetic Survey investigated the area on 1 July 1941 that the Goose Bay location was selected. Fry beat by three days a similar United States Army Air Forces (USAAF) survey team under Captain Elliott Roosevelt; the American team had first investigated nearby Epinette Point before joining Fry at the sandy plains that would become Goose Bay. These surveys used amphibious aircraft that landed at the Grenfell mission; from there the teams explored by boat. Eric Fry recalled: "The airport is actually located on the plateau at the west end of Terrington Basin but it is only five miles inland from the narrows between Goose Bay and Terrington Basin. Having a Gander air base in Newfoundland I suggested we call the Labrador site Goose Bay airport and the suggestion was accepted." Under pressure from Britain and the United States the Canadian Air Ministry worked at a record pace, and by November, three 2,100-metre (7,000 ft) gravel runways were ready. The first land aircraft movement was recorded on 9 December 1941. By spring of 1942 the base, now carrying the wartime codename Alkali, was bursting with air traffic destined for the United Kingdom. In time, the USAAF and the British Royal Air Force (RAF) each developed sections of the triangular base for their own use, but the airport remained under overall Canadian control despite its location in the Dominion of Newfoundland, not yet a part of Canada. The 99-year lease arrangement with the United Kingdom was not finalized until October 1944. The northeast side of the facility was built to be a temporary RCAF base, complete with its own hangars and control tower, while the south side of the facility, built for the Americans, was being upgraded with its own aprons, hangars, earth-covered magazines, control tower and infrastructure. The Canadian and American bases were built as an RCAF station and later a United States Air Force base known as Goose AB, housing units of the Strategic Air Command and Aerospace Defense Command. It was later home to permanent detachments of the RAF, Luftwaffe, Aeronautica Militare, and Royal Netherlands Air Force, in addition to temporary deployments from several other NATO countries. Goose Air Base was the site of the first US nuclear weapons in Canada, when in 1950 the United States Air Force Strategic Air Command stationed 11 model 1561 Fat Man atomic bombs at the base in the summer, and flew them out in December. While returning to Davis–Monthan Air Force Base with one of the bombs on board, a USAF B-50 heavy bomber encountered engine trouble, had to drop, and conventionally detonate, the bomb over the St. Lawrence, contaminating the river with uranium-238. The design and layout of the Goose Air Base weapons storage area was identical, with only slight modifications for weather and terrain, to the three Strategic Air Command weapons storage areas in Morocco located at Sidi Slimane Air Base, Ben Guerir Air Base, and Nouasseur Air Base, which were constructed between 1951 and 1952 as overseas operational storage sites. The last nuclear bomb components that were being stored at the Goose Air Base weapons storage area were removed in June 1971. The storage was being built to accommodate components of the GAR-11/AIM-26 "Nuclear" Falcon, which is normally stored in pieces, requiring assembly before use. The former U.S. facilities were redesignated CFB Goose Bay (the second time this facility name has been used). The value of the airfield and facilities built and improved by the USAF since 1953 and transferred to Canada were estimated in excess of US$250 million (equivalent to $1.1 billion today). By 1976 all Strategic Air Command assets had been stood down, and only USAF logistical and transport support remained. In response to lessons learned from the Vietnam War and the growing sophistication of Soviet anti-aircraft radar and surface-to-air missile technology being deployed in Europe, NATO allies began looking at new doctrines in the 1970s–1980s which mandated low-level flight to evade detection. CFB Goose Bay's location in Labrador, with a population of around 30,000 and area of 294,000 km2 (114,000 sq mi), made it an ideal location for low-level flight training. Labrador's sparse settlement and a local topography similar to parts of the Soviet Union, in addition to proximity to European NATO nations caused CFB Goose Bay to grow and become the primary low-level tactical training area for several NATO air forces during the 1980s. The increased low-level flights by fighter aircraft was not without serious controversy as the Innu Nation protested these operations vociferously, claiming[example needed] that the noise of aircraft travelling at supersonic speeds in close proximity to the ground ("nap of the earth flying") was adversely affecting wildlife, namely caribou, and was a nuisance to their way of life on their traditional lands. In 1983, a NASA Boeing 747 transport aircraft carrying the Space Shuttle Enterprise landed at CFB Goose Bay to refuel on its way to a European tour where the prototype shuttle was then displayed in France and the United Kingdom. This was the first time that a U.S. Space Shuttle ever "landed" outside the United States. In 1988, the Pinetree Line radar site (Melville Air Station) adjacent to CFB Goose Bay was closed. To provide rescue and range support to the jet aircraft operating from Goose Bay, the Canadian Forces provided a Base Rescue Flight consisting of three CH-135 Twin Huey helicopters. In 1993 the Base Rescue Flight was re-badged as 444 Combat Support Squadron and continued to operate the same fleet of three helicopters. In 1996 the CH-135s were replaced with three CH-146 Griffon helicopters. 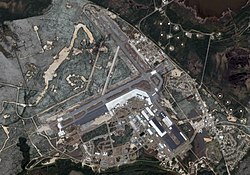 On 11 September 2001, CFB Goose Bay hosted seven trans-Atlantic commercial airliners which were diverted to land as part of Operation Yellow Ribbon, following the closure of North American airspace as a result of terrorist attacks in New York City and Washington, D.C. It was also the first Canadian airport to receive diverted aircraft. In 2004 the RAF announced its intent to close the permanent RAF detachment, effective 31 March 2005. The German and Italian air forces had agreements signed to use the base until 2006, however they were not renewed as of 2004. These air forces still operate at Goose Bay, but plan to initiate simulator training instead. The base continues in its role as a low-level tactical training facility and as a forward deployment location for Canadian Forces Air Command, although the total complement of Canadian Forces personnel numbers less than 100. Labradorian politicians such as former Liberal Senator Bill Rompkey have advocated using CFB Goose Bay as a site for a missile defence radar system being developed by the United States Department of Defense. Executives from defence contractor Raytheon have surveyed CFB Goose Bay as a suitable location for deploying such a radar installation. Civilian flights use a smaller terminal structure located on Zweibrucken Crescent. A new terminal structure was being built in 2012 to accommodate civilian use. The terminal has a single retail tenant, Flightline Café and Gifts with a Robin's Donuts shop. An increasing number of airliners (especially mid-range aircraft like the Boeing 757) have resorted to using Goose Bay for unplanned fuel stops, especially common for trans-Atlantic flights impacted by a seasonally strong jet stream over the North Atlantic. The majority of civilian airliners using the airfield are not regularly scheduled airlines to this location. Air Labrador was a tenant of the airport until the airline ceased operations in 2017 when it was merged with Innu Mikun Airlines as Air Borealis. It flew mainly from Goose Bay to remote communities in Newfoundland and Labrador and Quebec. Hangar 8 at CFB Goose Bay was designated as a Canadian historic place in 2004. ^ The thirteen-million-hectare (130,000 km²) bombing range is larger than Iceland; Portugal; Serbia; Austria; the Czech Republic; Ireland; Slovakia; the Netherlands; Denmark; Switzerland; Belgium. see List of countries and dependencies by area. ^ "British take their leave from Goose Bay". CBC News. 31 March 2005. Retrieved 12 January 2013. ^ "5 Wing Goose Bay". Canadian Royal Canadian Air Force. Retrieved 1 June 2015. ^ "A World of Opportunities in Canada's Bright Light of the North - Business In Focus". www.businessinfocusmagazine.com. Retrieved 20 October 2018. ^ a b c d e f Force, Government of Canada, National Defence, Royal Canadian Air. "History - 5 Wing Goose Bay- Royal Canadian Air Force". www.rcaf-arc.forces.gc.ca. Retrieved 20 October 2018. ^ "Military Presence In Labrador". Archived from the original on 16 November 2007. ^ "Strategic Air Command Bases". www.strategic-air-command.com. ^ Clearwater, John (1998). Canadian Nuclear Weapons: The Untold Story. Dundurn Press Ltd. p. 18. ^ "Shuttle Enterprise begins international tour". UPI. 16 May 1983. ^ Air Force Public Affairs / Department of National Defence (15 June 2007). "444 Squadron History". Archived from the original on 26 January 2007. Retrieved 29 October 2007. ^ AEROWARE / RCAF.com (n.d.). "No. 444 Squadron". Archived from the original on 13 October 2007. Retrieved 2007-10-29. ^ "To Cope with Flying Restrictions, German Pilots Turn to Simulators". Defense Industry Daily. 4 February 2010. Retrieved 25 August 2011. ^ "U.S. missile company scouts Labrador". ^ "CBC.ca - Labrador Morning Show - A tour of the New Airport in Happy Valley Goose Bay (Part 1)". cbc.ca. 12 April 2013. Retrieved 1 June 2015. ^ "Strong jet stream forcing airliners to make Labrador retrievals". thestar.com. 14 January 2015. Retrieved 1 June 2015. ^ a b Force, Government of Canada, National Defence, Royal Canadian Air. "5 Wing Goose Bay - Royal Canadian Air Force". www.rcaf-arc.forces.gc.ca. Retrieved 20 October 2018. ^ Force, Government of Canada, National Defence, Royal Canadian Air. "444 Combat Support Squadron - 5 Wing - Royal Canadian Air Force". www.rcaf-arc.forces.gc.ca. Retrieved 20 October 2018. ^ "HistoricPlaces.ca - HistoricPlaces.ca". www.historicplaces.ca. Retrieved 20 October 2018. Carr, William G.: Checkmate in the North. MacMillan, Toronto, 1944. Christie, Carl A.: Ocean Bridge. University of Toronto Press, 1995. Hansen, Chris: Enfant Terrible: The Times and Schemes of General Elliott Roosevelt. Able Baker, Tucson, 2012. Staff writer (c. 1942). Pilots Handbook of Aerodromes and Seaplane Bases Vol. 1. Royal Canadian Air Force. Wikimedia Commons has media related to CFB Goose Bay. Past three hours METARs, SPECI and current TAFs for CFB Goose Bay from Nav Canada as available. This page was last edited on 24 March 2019, at 12:25 (UTC).